I had a nice chat with UCLA Professor of Physics & Astronomy, David Jewitt last night after his thought provoking research colloquium “Planets and Exoplanets.” Jewitt’s range of topics for the talk was broad. He started with a current view of our very own solar system – not the boring, rather static one that we all learned in grade school, but the new and much more dynamical model. He also examined the popular methods for exoplanet discovery: radial velocity (wobble), transit, direct, and microlensing. Toward the end, he touched on the question of life on other planets including the moons Europa and Enceladus. It was a rigorous treatment with plenty of detailed scientific graphs and formulae. The scope of the presentation was for fellow faculty researchers, researchers from other fields, and the general public (he led off the discussion with a humorous disclaimer that the success for such a broad reach was impossible and someone was likely to be disappointed – I guarantee that everyone was quite pleased). As good as the lecture was it was my discussion with Professor Jewitt afterward at the reception that was the most enjoyable. I inquired about the discovery of Gliese 581g, the exoplanet recently announced that is around three times the mass of Earth and inside the host star’s so-called “habitable zone” where liquid water could exist. The announcement on Sept. 29 by Vogt et al from UC Santa Cruz, was one of the biggest science headlines of the year. 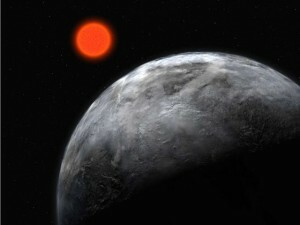 The star Gliese 581 is a mere 20 light years away. It’s tempting to make a big deal out of this or present it as some kind of embarrassment, but this stuff is the meal ticket of science. Jewitt looks at these occurrences of one upmanship as healthy scientific competition between different groups that yields better science in the long run and certainly makes things exciting. As I strolled away from the California NanoSystems Institute Auditorium where the talk was held, I reflected on Jewitt’s words. The situation reminded me of the long held competition between the UCLA Galactic Center Group and the Max Planck Institute for Extraterrestrial Physics, the likes of which has yielded some of the most amazing results in the past decade. It’s not unlike watching well conditioned athletes competing in the Olympics – the race is exciting, but in the end it is the advancement of the sport that matters most. So too with competing scientific teams – we all win when the race is over and new truths about the universe are known. I took in that lecture as well and had a fantastic time with it. I am on staff at the NanoSys Institute and thought it would be an interesting diversion. Wasn't disappointed. Good crowd too.